If you're like me and furiously checked to see if your cable plan has Starz so you can check out the hype surrounding Outlander, fear not: I'm not judging. The show has everyone talking, and its stars have become bona fide celebrities. 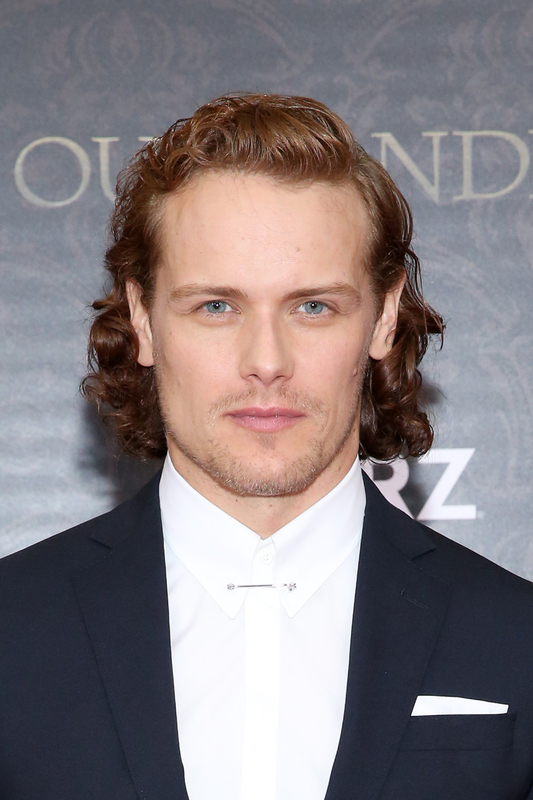 Furthermore, if you're still like me, you're obviously wondering if Sam Heughan is dating anyone. Of course, Outlander fans are desperately shipping Jamie and Claire as a couple in real life, due to their intense on-screen chemistry. Unfortunately, it seems the Scottish actor is pretty private about sharing his relationship status with the world. In fact, last summer, when E! News asked him outright if he was dating anyone, Heughan was annoyingly coy about it, and said, "Who’s asking? Are you asking? Well I might tell you someday ... I might be." And in my valiant effort to scour the Internet for juicy tidbits about his romances, I found nary a tabloid headline nor cozy couples' selfie on his feeds — the actor, who has been steadily working in theater, film, and TV since 2001, doesn't appear to want to give up the goods about his private life. And can you blame him? Paparazzi would likely follow him everywhere if his relationships were public knowledge. We're not together. It's funny. We've always said from the get go that we're incredibly great friends. And to have that friendship and that closeness and to be able to get along as we do on set, it's great that we're able to get along that well. We're not together. I'm sorry to break people's hearts. They like to try to maybe replicate the Claire and Jamie story. But I think it would be difficult for us to work together and be together. For his part, Heughan said, "No, I think it's strange, isn't it? Because I think people buy into the show and us saying it's not real, they feel like they've been duped. It's like, ‘You acted it. You lied to us!' And I'm like, ‘Well, sorry!'" I guess for now, it seems the question of Heughan's single status remains unanswered — the actor doesn't even have a "personal life" section on his Wikipedia page, for crying out loud. Though he's very open with fans on social media, frequently tweeting and sharing photos from his travels and leisure time, it seems he's all about keeping certain things private. Sorry, shippers. For now, Heughan and Balfe's romance is strictly on your TV screens.